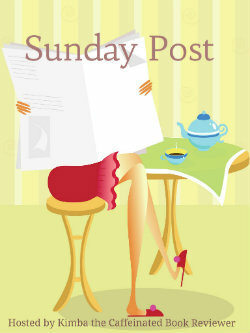 The Sunday Post is a weekly meme hosted by Kimba the Caffeinated Book Reviewer. It’s a chance to share news, a post to recap the past week on your blog, showcase books and things we received and share news about what is coming up on our blog for the week ahead. Before I get in to this week’s recap, I just want to address two huge, sad stories that have broken overnight. Firstly, the fact that George Zimmerman has been acquited of the murder of Trayvon Martin. This stuns me. My thoughts go out to Trayvon’s family, and I hope one day they get the justice they deserve. Secondly, the passing of Cory Monteith. I’ve been a huge fan of Glee since day one, and have stuck with it even though good and bad. Finn was never my favourite character, but I liked Cory, his sense of humour and the fact that he was very honest about who he was. Thiry-one is no age, and my thoughts go to his family, friends and colleagues. Now, on to the recap. I’m toying with starting a new feature, so keep an eye out for that. I am curious as to what your new feature will be. Happy reading. The news about Cory was shocking. I'm still stunned. Looking forward to seeing what your new feature is! Just something I'm toying with, and I don't want to say too much in case I don't end up doing it. Also, I think calling it a feature is me being a bit grandiose! It's just going to be a new regular post from me, something I haven't done before but other book bloggers have. I was reading more stuff about Cory yesterday, and then it just hit me that he won't be around anymore and I got sad all over again.